Elsenborn Ridge – January 1945. “… My selection for a patrol came at dusk of what promised to be a very cold night in mid-January. It was our platoon’s turn, and Sgt. Degamo was making up a 12-man patrol from each of the three squads; the mission was to capture one or more German prisoners for interrogation. Degamo said I would be the point man with my BAR since they needed as much fire power as possible up front in case of trouble. I protested that I was night blind, might lead them into a trap, etc., holding up my glasses for him to observe the thickness of the lenses. My foxhole buddy, Jim Speer, confirmed that I was blind as a bat at night, and it was later decided that I would take up the rear as the get-away man to provide fire cover while returning. The patrol leader was an unusual fellow from another squad named Ray Flick who had come in as a replacement. He was unique in actually showing enthusiasm for our violent way of life. Flick volunteered for patrols, and, there was a rumor that he had ridden shotgun for a mob boss back home in Detroit. He was actually from southwestern Pennsylvania. Stocky, of indeterminate age with pale blond hair and expressionless gray eyes, he was not very impressive looking, but his actions belied his appearance. In short order, he had armed himself with a Thompson sub-machinegun acquired somehow, possibly taken at gunpoint from a tanker. They were not issued in the rifle companies. Thus armed, Flick led us into the night toward the German lines. Most of us had been given bed sheets to use for camouflage. Our helmets were covered with strips of white sheet. I wore my Christmas scarf and wool knit cap below the helmet liner. I had left my wallet and personal effects with Jim. It was silently understood what his responsibility was in regard to them. It was so cold, the snow crunched loudly under our boots. Fortunately there was no moon, and the wind was blowing, which tended to mask the sound. Past our Iast observation post manned by two GIs with a sound powered phone, we ascended the steep ridge that marked no man’s land, the enemy positions somewhere on the other side. At the top of the ridge, the word had passed that the German lines were just beyond a sunken road lined with trees at the base of the ridge. We trudged through the deep snow to the sunken lane and took up positions – a party of four at each end of the lane facing in all directions and a party of three with Flick to try to find a prisoner on the east side of the lane. During an earlier thaw, the snow had melted on the trees and bushes of the hedgerows on either side of the lane, and the ice rattled in the wind helping to conceal our approach and whispered commands. The minutes dragged on as we peered into the darkness, imaginary figures materializing from the hedgerow as our eyes strained to distinguish objects. The only sound was the clicking of the ice chandeliers. 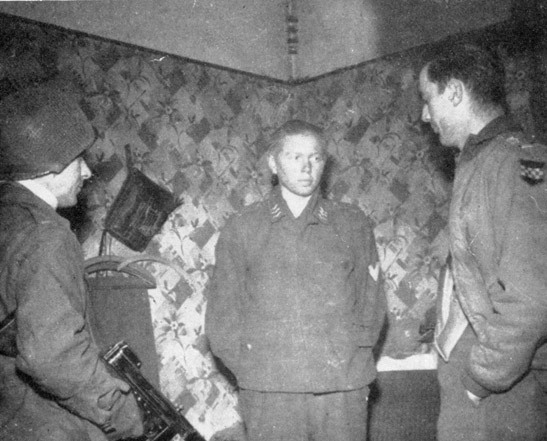 393rd Regiment Interrogation officer (right).